Sounds like pretty bad advice huh? When you’re given the ole’ heave ho, don’t take it personally. Unless you were caught sleeping with someone or something you were not supposed to, or caught embezzling money, chances are you are just being let go cause you someone has to go and you are the unlucky one. Don’t waste time on bitterness. This is something I wish someone told me…just forget about it and move on…any time you spend being angry or bitter is time you are not working on getting a new gig. Rejection happens to everyone; accept it as a fact of life. If I had a nickel for every girl who said no when I asked to make out with me, I would have $45…see what I mean? Follow your dreams. Take a few hours and figure out what you really want to do. You have no excuses anymore not to take a chance and try to do something that will make you happy. 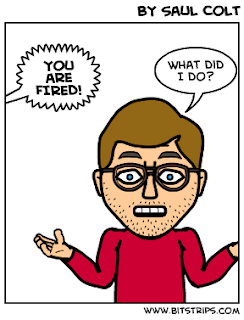 Tell everyone you know that you were Fired. Don’t be embarrassed, people get canned all the time and there shouldn’t be a stigma attached to it. Scream it from the rooftops because if you are not honest people may find out and by telling people they may know of a gig that could be your dream role! I love your attitude – this is a great post! I’m sharing it with a friend who got laid off recently. I think it’s natural to feel insecure or ashamed after a lay-off but your way of looking at it is so much more empowering. You rock! Sounds like good advice. I was just laid off so this give me a lot to think about. Sorry to hear your news. If you lived here I would hire you….without an interview!